I was certain when I sat down at the Lincoln press conference this morning I'd focus on the fact that the car looks like John Wilkes Booth. And then I saw the mimosa station and realized I was wrong. The story here is Lincoln is so desperate to pretend they're a luxury manufacturer they've got a mimosa station. And a live rock-classical fusion band. Why Does The Lincoln MKZ Concept Look Like John Wilkes Booth? If Lincoln is a luxury brand, apparently it's the luxury brand of people who get drunk off blood orange mimosas at 8 am and listen to rock-classical fusion. Maybe that explains why no one buys their cars. Ford VP Jim Farley spoke of this car as the reinvention of the brand. He spoke of "individual touch" and building luxury dealers that aren't like "box box" retailers. That was a shot at companies like BMW and Mercedes. You know, successful car companies. If an Audi buyer stays at The Intercontinental, the new Lincoln buyer will stay a boutique hotel. They'll eat at The French Laundry. The cars will feel bespoke. Audi sends you one salesman? Lincoln will give you two. 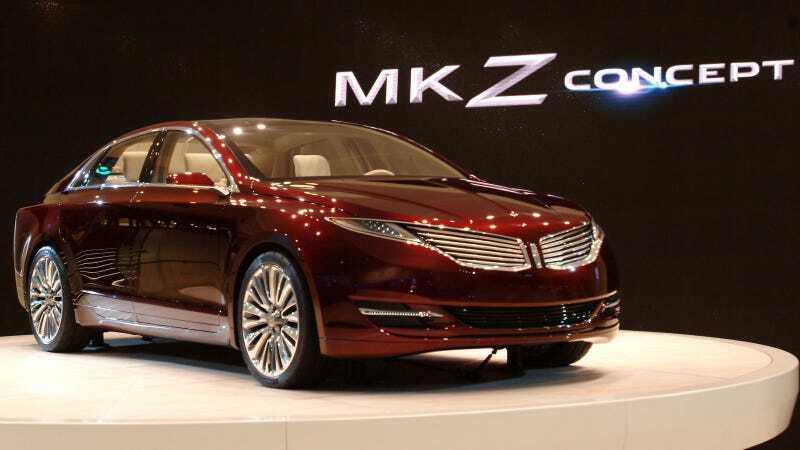 All of this was then followed up by the reveal of the Lincoln MKZ Concept. The influences are obvious. The taillights borrowed from the Rapide, the rear greenhouse lifted by the A7, and the grille modeled after Snidely Whiplash's Mustache — all mashed into the body of a Toyota Camry. But it doesn't matter how it looks. It doesn't matter whether the buyer eats at Craft or eats at Outback Steakhouse. It doesn't matter if the company has a team of burly men to hoist you on your back and carry you around their showroom floors. None of it matters because Lincoln's own worst enemy is right next to its display. So long as Ford continues to build upscale, cheaper cars on the same platform, why buy an MKZ when you can spend less money and get an equally attractive 2013 Ford Fusion? What's the compelling case for Lincoln? There is none. Almost none of Lincoln's arguments were about product. They were about image. The didn't even commit to building this car because that would mean talking definitively about Lincoln's future. Tom Ford Lip Gloss on a jamón iberico is still lipstick on a pig.